Cheese sticks. They’re the ultimate bar food, the perfect party food, and kids love them. We’re definitely fans of a good cheese stick and this week, we combined to of our favorite snacks – Frigo® Cheese Heads® cheese sticks and pretzels – for the definitive snack. Frigo® Cheese Heads® Pretz-arella Cheese Sticks! They’re crunchy, they’re cheesy. They go great with mustard or marinara and everyone in the house will love them. They’re perfect for game day or a day at home. They’re easy to make and are a fun new twist to and old favorite. In a bowl, combine ¾ cup of flour, 2 tablespoons of freshly grated parmesan cheese, ¼ teaspoon black pepper, ½ teaspoon garlic salt and 1 teaspoon of dried parsley flakes. In a dish, beat 4 large eggs with ¼ of whole milk. Finally, place 2 cups of crushed or processed thin pretzel rods. 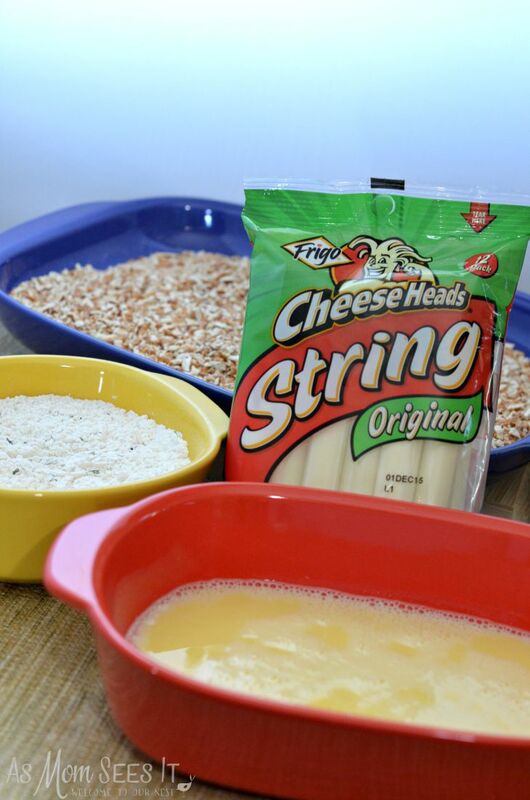 Open each of the Frigo® Cheese Heads® Mozzarella Cheese Sticks and cut each in half. You can make as many as you’d like – just a few or the whole package. Roll each of the cheese sticks in the egg mixture, then in the flour mixture. Then, dip them again in the egg mixture and push them into the crushed pretzels. I like to pile the pretzels on top and press lightly to make the pretzels stick; if you roll them, some of the mixture might roll off. Once the cheese sticks are rolled in the flour and in the crushed pretzels, heat your deep fryer and drop them in for 15-30 seconds. Lift out of the oil carefully and place on a paper towel to dry. Serve and enjoy the accolades. This is a sponsored post on behalf Frigo® Cheese Heads®. 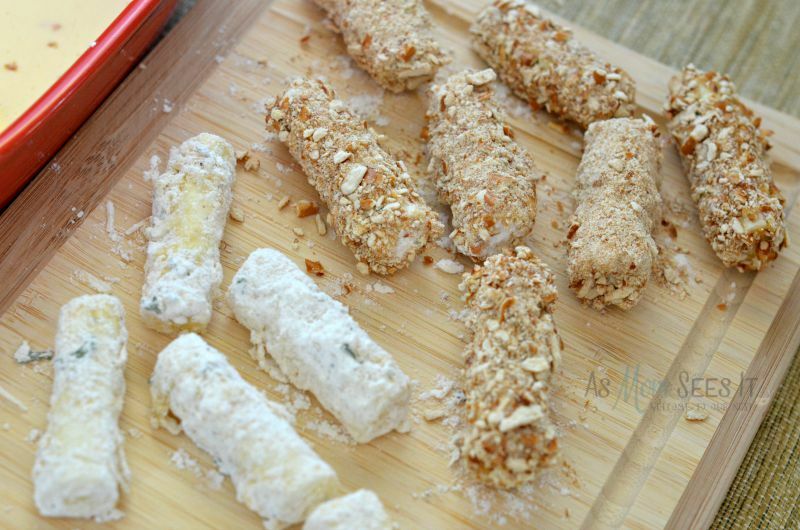 A fun new take on a classic snack, these pretzel coated cheese sticks are the perfect party snack. In a bowl, combine the Parmesan Cheese, pepper, garlic salt, dried parsley and flour. In a pan, spread the crushed pretzel sticks. Cut each cheese stick in half. Dip in egg mixture, then flour mixture. Dip each again in the egg mixture then into the crushed pretzels. Drop in fryer for 15-30 seconds. Set on paper towel to drain grease and serve with mustard or with marinara sauce. 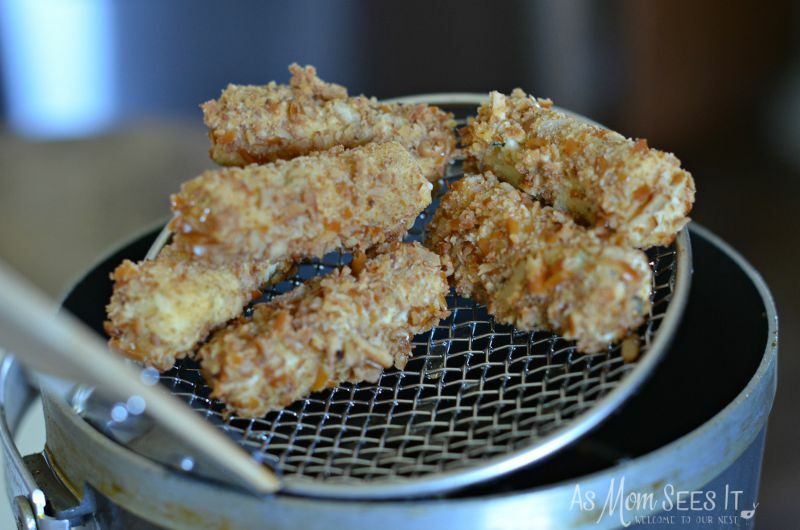 I love cheese sticks and this is a great idea for a recipe. I never thought to make something like this out of cheese sticks. It looks delicious.